Runika Jones is a four-foot-five professional thief, mischief-maker and amateur runecaster. But one thing she isn’t, is stupid. So when Runika picks the pockets of the Archmaster Luniorn the Green, headmaster of his own runecasting academy for misfit wizard apprentices, she figures she’s done for. But instead, Luniorn offers her a deal: come study at his academy, learn how to properly cast runes, impress him, and graduate. That, or be turned over to the mercies of the Baroness’s keep guards. Runika and the Six-sided Spellbooks is a new game by designer Shannon Kelly (creator of Lucidity: Six-sided Nightmares) and Fox Tale Games, coming to Kickstarter on April 30th, 2019. In Runika, 2 to 4 players take on the roles of students at the Archmaster Luniorn’s academy for wizard apprentices. Through one mishap or another, these apprentices have landed under his charge, and he is going to teach them runecasting … even if it kills them. A game of Runika and the Six-sided Spellbooks is played over a series of rounds, until one player has 20 points. In each round, players will draft customised dice, roll them, and place them in specific runic patterns to cast spells and impress their professors. A single game should take between 60 to 90 minutes. Every round, the player who holds initiative (a fancy way of saying “the first player”) will draw 4 dice from the bag for each player in the game. So in a four-player game, there will be 16 dice in the middle of the table. Each dice represents a different element (fire, earth, water, air), and these elements form the raw materials that you need to make runes and cast spells. Players then take turns drafting these dice from the middle of the table, collecting them one at a time until every player has 4 dice stored on their boards. Once all dice have been stored, players roll their stored dice, and then spend any of their stored dice to reroll. On each player’s turn, they will take the dice they have stored and push them, one at a time, onto their 4×4 spell grid. This grid is where all the action happens in Runika. 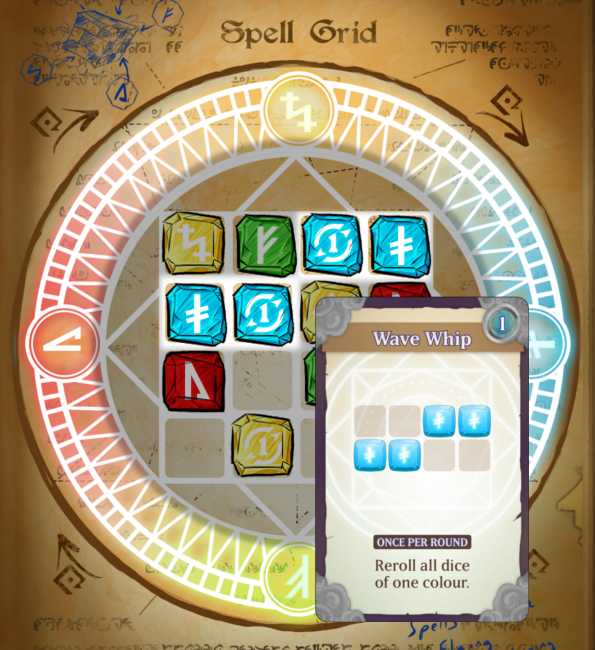 Your stored dice are pushed onto the grid from the side matching their colour, as determined by your elemental disk. Dice that are on your grid can be pushed by other dice. Part of the puzzle is figuring out how to get dice from one part of your grid into a pattern that will score you the points you need to win. Later you will get to meet the professors, who offer special powers that will aid you in placing your dice in the right positions. One of the unique things about Runika is that your elemental disk can rotate. This means that the side you are pushing dice on from is never static. 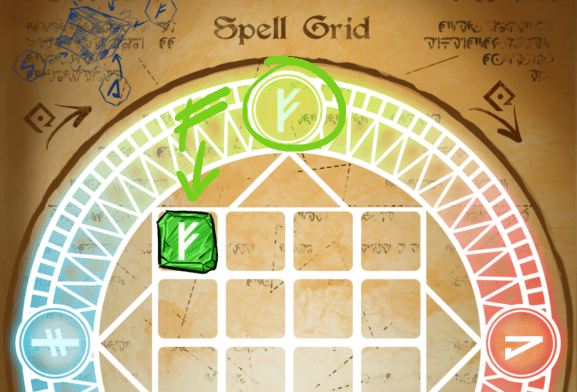 Whenever you resolve a dice that shows a “rotate” symbol, you must rotate your elemental disk once clockwise. This means you could push a green dice on from the top, then rotate your disk, and then push a second green dice on from the right-hand side. At the end of your turn, if the dice on your card match one of the Rune Cards in the play area, you can use those dice to score. If any of those dice show “points” symbols, you score bonus points. Runes come in all different shapes, sizes and colours. Each provides you with a number of points, and a special ability that will help you to gain further runes. 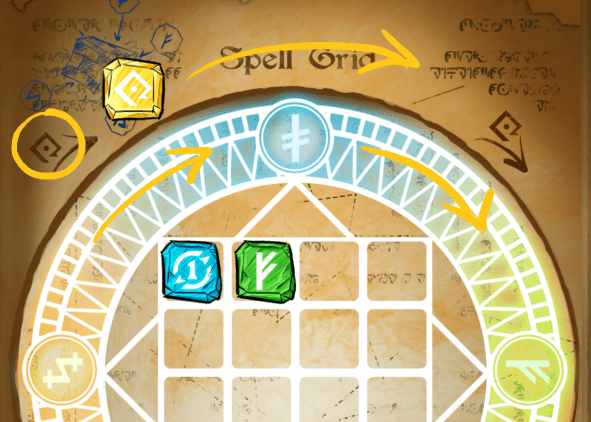 Runes can also be completed in any position or rotation, giving Runika a spacial puzzle element. Those who are able to rotate images in their heads easily will find this game much to their liking. When a player reaches 20 points, the round finishes and the game ends. Count up your points, and the player with the most wins. 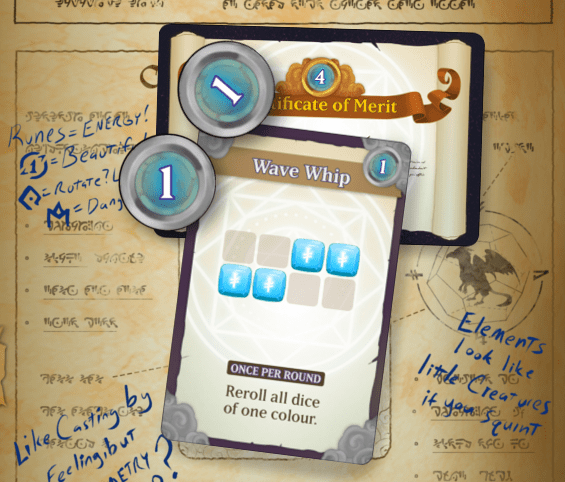 In the example on the right, this player has 7 points: 1 from Wave Whip, 2 from bonus points and 4 from a merit card they gained by impressing their professors (more on that in another preview). That’s it for today! 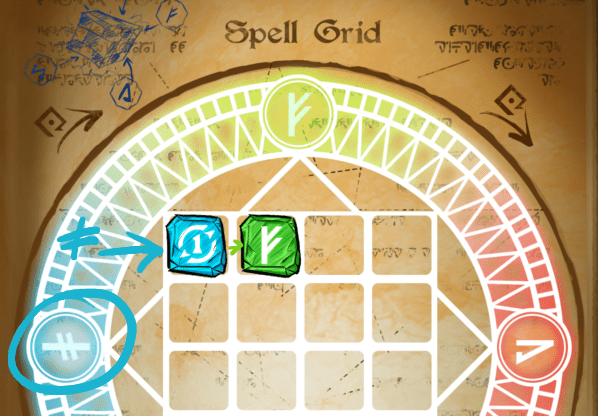 Runika and the Six-sided Spellbooks is due to hit Kickstarter on 30 April 2019. If you are interested in a game about teenage wizard apprentices at a magic academy, feel free to sign up to our newsletter for further updates, or keep checking back here as we roll out the game.